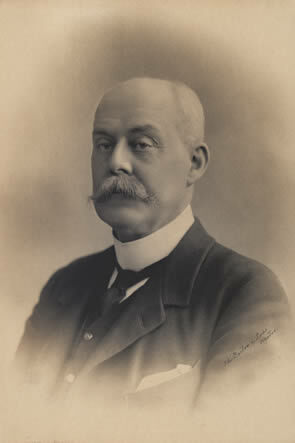 Born in Leicester in 1846, Franklin was the son of George Barton Franklin, founder of Stoneygate School, Leicester, and President of the Society in 1864-65. He was first education at his father’s school and then in Leatherhead before entering St. Thomas’s Hospital, London, as a medical student. After qualifying M.R.C.S. in 1870 and L.R.C.P. in 1871, and remained in London holding various medical appointments and completing his F.R.C.S.in 1873. The following year he returned to Leicester to set up his own medical practice in 1874, with some advice and support from Dr. John Barclay (a stalwart of the Lit. and Phil. Over many years and President for 1857-58), though they did not enter into a formal partnership. Specialising in midwifery alongside general medicine in his own practice, he was also a surgeon to the Leicester Royal Infirmary from 1886 to 1906, when he retired under the Infirmary’s age limit, but continuing his association with the Infirmary as an honorary consulting surgeon, while he was also surgeon to the Midland and the North-Western Railway Companies.. When the British Medical Association accepted Leicester’s invitation to hold its annual meeting in Leicester Dr. Franklin was appointed the BMA’s President for the year as a whole, and form the Leicester meeting in particular, which was considered to be a model of its kind. His Presidential Address to the annual meeting, a review of medical education, past, present and future, stressed the importance of making the study and practice of obstectrics and surgery in all medical training, and argued that a minimum of a year’s hospital service as a house officer should be compulsory before a doctor is allowed to enter independent practice. His arguments in the Address were very influential in subsequent debates in the BMA and more widely about the further development of medical education. The following year he completed his year of office with the BMA annual meeting in Toronto, and during the meeting he received the honorary degree of LL.D. from the University of Toronto. In 1910 failing health led him to retire from his practice and other appointments and two years later he moved to Fareham, Hants., However, with the outbreak of World War I he returned to medical work as Commandant and Medical Officer of a Red Cross Hospital and Medical Officer of two other hospitals in Hampshire that had become military hospitals, and he also served on the local medical board of the Ministry of National Service. When the Order of the British Empire was established in 1917 he was made a Member of the Order (M.B.E.) in the first list of appointments to the new Order. Quite apart from his medical career and voluntary service, Franklin was also very active in many other areas of community and public service, particularly in Leicester. In addition to his presidency of the Lit. and Phil. he was also President of the Leicester Medical Society and of some local musical societies, and served for some years as a Borough councillor and Justice of the Peace. Reference: Obituary British Medical Journal 14 June 1919, p. 754.